The Obama administration ignored and even deleted information that could have prevented the terrorist attack on the Pulse Orlando nightclub that killed 49 people, a former Department of Homeland Security (DHS) official said on June 21. 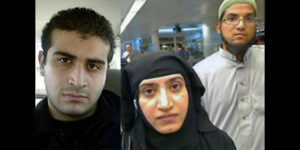 Omar Mateen, left, and Syed Farook and Tashfeen Malik. Philip Haney, in an interview on Fox News Channel’s “Hannity”, said there is a good chance the terror attacks in Orlando and San Bernardino, California could have been prevented had the DHS not deleted a list he compiled linking some Muslims with terrorism. Haney told host Sean Hannity he was able to link a mosque where San Bernardino terrorists Syed Farook and Tashfeen Malik worshiped to a network that tied the mosque where Orlando shooter Omar Mateen worshiped, but the Obama administration deleted his database. “Farook would have been put on the no-fly list and not allowed to travel, or his pending fiancé would have been denied a visa because of his affiliation with an organization with plausible ties to terrorism,” he said. Haney affirmed to Hannity that it was “a fair statement” that the Obama administration wiped out the work that could have saved American lives.